“Looking back to the number of incidents in 2017 which increased by 16% compared to 2016, the 15% decrease in the first half of 2018 compared to the same period in 2017 is welcome news. Nonetheless, continued vigilance by all stakeholders is an effective deterrence to maritime crime, and we urge heightened measures to be taken in the areas of concern,” said Masafumi Kuroki, Executive Director of ReCAAP ISC. Throughout 2017, ReCAAP ISC embarked on incorporating Data Analytics into its analysis to enhance its information sharing capabilities. 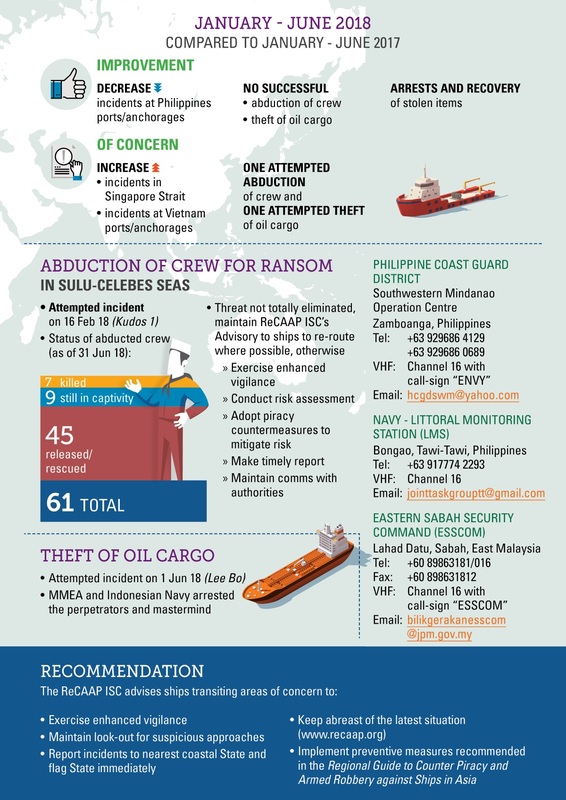 Since 2007, ReCAAP ISC has collected the data of over 1,500 incidents of piracy and armed robbery against ships in Asia. These data enable the Centre to conduct deeper analysis on the nature of incidents. 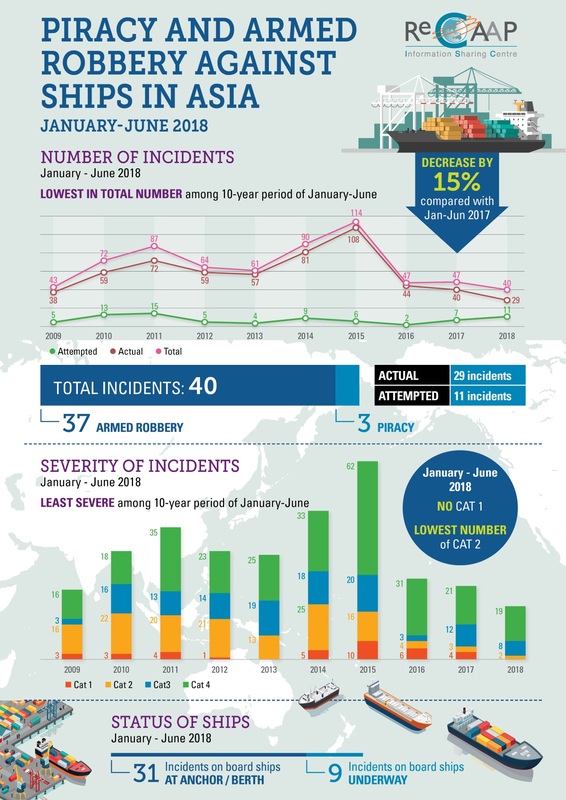 Using Data Analytics, ReCAAP ISC has made analysis, in the Half-Yearly Report, on the main characteristics of incidents at ports and anchorages in Bangladesh, the Philippines and Vietnam as well as incidents on board ships while underway in the Straits of Malacca and Singapore, particularly the Singapore Strait. “At ReCAAP ISC, we are at an initial stage of using Data Analytics to yield insights from our collected data. There is much to learn as we build internal capability in using Data Analytics, and we will continue to do so in order to produce meaningful and useful analysis for our partners and stakeholders in the maritime community,” concluded Masafumi Kuroki.